I find this quite odd, and nice. I’ll certainly take it. 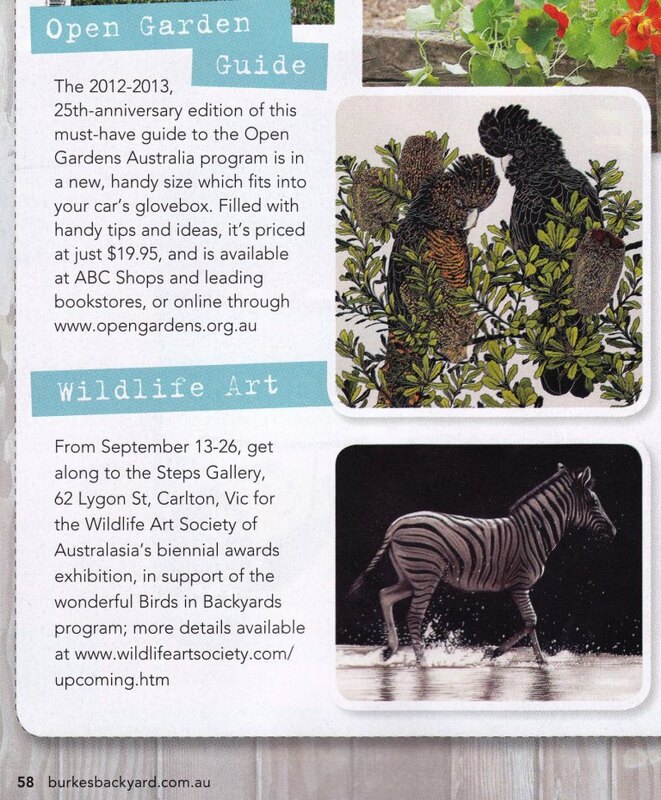 Our wonderful Kris Peter of the Wildlife Art Society of Australasia managed to get a bit of publicity in one of our famous Australian magazines, Burke’s Backyard (which is a spin off from a hugely successful garden TV show). It advertises WASA’s “Wild Awards”, our biennial (once every two years) major show. It’s all sorts of wildlife art but it’s in support of the “Birds in Backyards” program. Kris sent them lots of paintings of birds for them to choose from (to keep it relevant to the theme), and they chose one of my zebras!! Admittedly they also chose a gorgeous piece by Vida Pearson of genuine birds. By the way, if you click the link to Kris Peter’s site you will see that her bird paintings are absolutely delightful.